Jules Feiffer is in The Wall Street Journal! In light of our successful Kickstarter campaign, Jules Feiffer keeps popping up in the media. 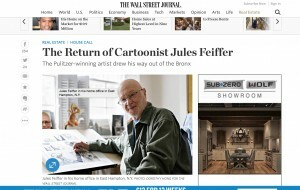 Check out this interesting new article on Jules Feiffer, only found in The Wall Street Journal! Previous Post3 days left, we just crossed $20,000 Stretch Goal, got new Press & new secret videos!Next PostJON CRYER TWEETED US!!! 2 MORE DAYS LEFT!! !